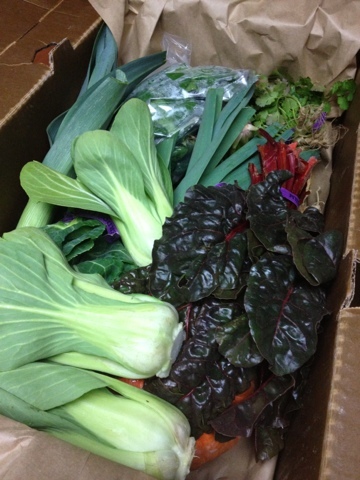 Last week I signed up for the Mountain Bounty Farm CSA vegetable share and picked up my first box -- it was full of yummy greens! I'm looking forward to my weekly boxes. So you can imagine I've been cooking, but I'm just sharing one with you today. This is a favorite around our casa. Place the sesame seeds in a small skillet and heat over medium heat shaking the pan often, until fragrant and toasty, 1 to 2 minutes. transfer to a small plate and set aside. Bring a large pot of salted water to a boil. Add the noodles and boil until they are tender, 3 to 4 minutes (unless the box states otherwise). Drain and set aside. Heat the canola oil in a large nonstick skillet over medium heat. Add the garlic and cook, stirring often, until fragrant, about 1 minute. Stir in the bok choy stems. Add the ginger and soy sauce and cook until the stems are just tender, about 3 minutes. Add the shrimp and cook, stirring often, until the shrimp begin to turn opaque, about 2 minutes. Stir in the drained noodles and toss to coat. Stir in the bok choy greens and sesame oil and cook, tossing often, until they just begin to wilt, about 4 minutes. Finish with the lemon juice, sesame seeds and scallions. Who doesn't love a good noodle dish? Love all the ingredients you put in this. yum! i made something very similar to that with my bok choy! love it! wow, your veggie box looks fantastic! mmm this recipe is delicious, I guess I should attempt to make it. This looks so yummy!! We have those vegetable shares too. They even deliver to where we work. I've never signed up because my dad grows so much of his own veggies and since I only live about 45 minutes from them I get to enjoy what he grows which is great!! :-) But these programs are awesome for people who don't have that and want really fresh produce. 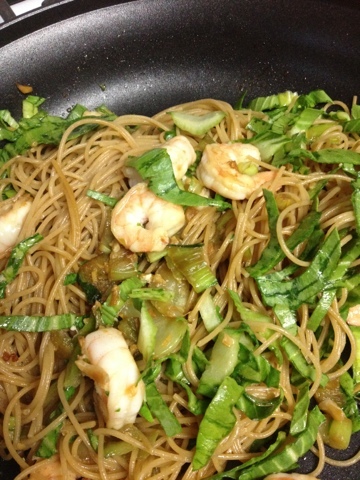 Ooh lemony shrimp and bok choy this dish sounds great!! A must make for me! where did you get the recipe? It's full of tasty healthy recipes. Love your healthy lo mein... bring it by foodie friday today. Love to have you join us. This looks awesome! CSAs are such great ways to explore new foods.